I am a huge lover of shrimp and I recently made the move to Charleston, SC and live just a few miles from the coast and a fabulous fresh seafood store. 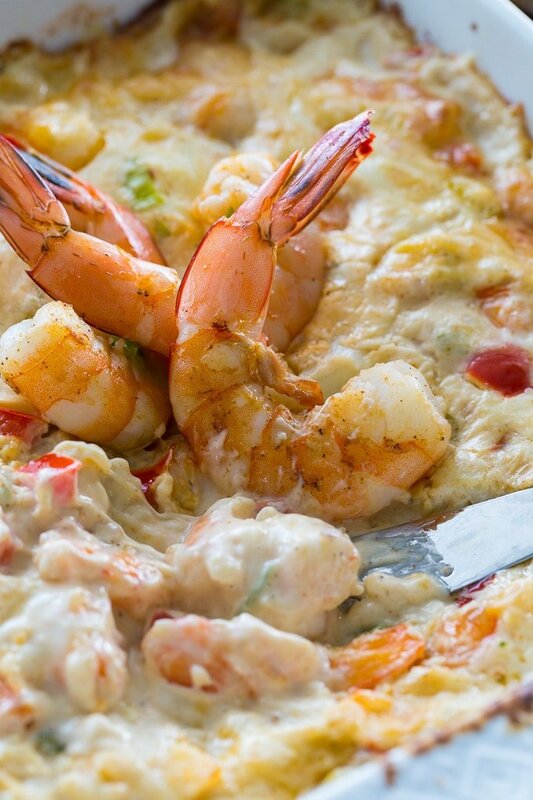 So be preapred for lots and lots of shrimp recipes. The shrimp I get here are so fresh and delicious, it would be a crime to not cook them at least once a week. 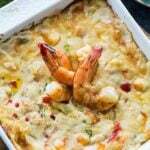 This shrimp dip is full of diced shrimp so it’s best to use very fresh shrimp if possible. If not I would buy frozen shrimp and be sure to defrost them and then blot them well with paper towels to get rid of any excess moisture. A combination of cream cheese and mayonnaise makes this dip supremely creamy. And lots of mozzarella cheese plus some Parmesan cheese give it lots of gooey cheese flavor. I like how well mozzarella melts in a dip, but you could also use Monterey Jack cheese or a combo of Monterey Jack and cheddar cheese. I like to serve Spicy Shrimp Dip with toasted baguette slices or tortilla chips. 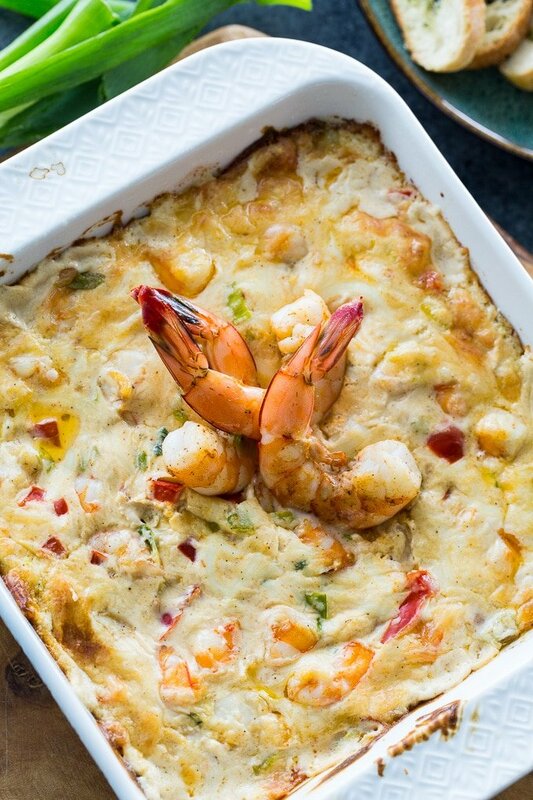 This dip really packs the flavor and if you are a fan of shrimp, you will have a hard time pulling yourself away from it. It will be a hit at your next party! Preheat oven to 375 degrees and lightly grease an 8x8-inch baking dish. Set the 3 shrimp with tails left on aside and cut remaining shrimp into bite-sized pieces. (I cut each shrimp in 3 to 4 pieces). Add butter to a large nonstick pan and place over medium-high heat. Add red bell pepper and cook for 2 minutes. Add green onion, shrimp (including the 3 whole shrimp) and garlic. Sprinkle with 1 teaspoon Creole seasoning. Cook for about 2 to 3 minutes. Shrimp will cook more in the oven so you want it just barely cooked through or even slightly undercooked. Transfer mixture to a bowl to cool slightly. Return the 3 whole shrimp to the pan to cook a little longer if they need it. You want them fully cooked. In a large bowl, mix together cream cheese, mayonnaise, lemon juice, and Worcestershire sauce. Use a wooden spoon or hand-held electric mixer to mix until smooth. Add remaining Creole seasoning, crushed red pepper flakes, shrimp mixture, and both cheeses and hand mix together. Transfer mixture to prepared baking dish and bake for 20 to 25 minutes. Garnish with the 3 whole shrimp and serve. This entry was posted in Appetizers and tagged dips, seafood, shrimp. Bookmark the permalink. This is the best dip ever. I always get compliments whenever I take it anywhere. This was great! I made some minor modifications based on our tastes. I used 1/4 diced yellow onion in lieu of green onion, and added 4x creole seasoning, as well as added jumbo lump crab meat. It was DELICIOUS! Love this. I wanted to make something different on a Sunday afternoon. I tried it today and it was fantastic! I made this to serve for playoff football game. Absolutely delicious. Added a little more Cajun season to spice it up! THIS WAS A BIG HIT! Go Texans! This was awesome. I took it to Christmas dinner and it was a big hit. Definitely will make it again. 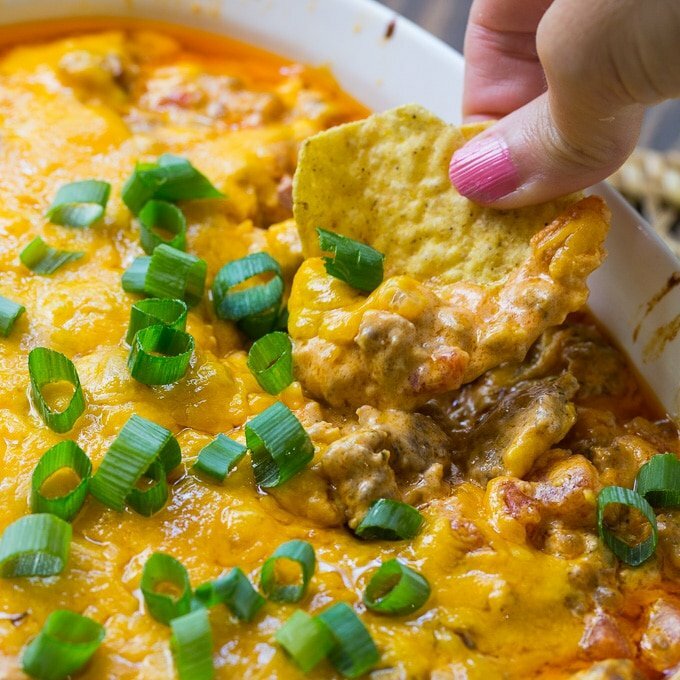 This dip is fantastic!!! Thank you so much for sharing, it’s a hit wherever I take it! Could you microwave to heat it instead of bake it ? Want to take to office potluck. I did, and we heated it up the next day too! This was easy to prepare and absolutely delicious. It will become a party staple for our family! The is my 2nd time trying this. My neighbour and kids so loved it I had to make again. This time split into 3 glass dishes and froze 2 for another time otherwise it will be gone in one day. I’m gonna use the smaller shrimp. Don’t see why we shouldn’t. If I need to cut the shrimp, can’t I use salad shrimp for the dip? It does look amazing. I will Pin it so I will have the recipe. Thanks so much!! Oh . My. Goodness. I love shrimp and spicy foods. Will be making soon. Also, I noticed you have a Spicy Sausage Dip. On the Hot Rotel Tomatos, is that the Hot Rotel tomatoes with green chiles? Or is there one with just tomatoes because I havent seen that ? What did everyone serve this with? Crackers, crostini, veggies??? I am thinking of serving it over baked potatoes! If I serve it as a dip, crostini or any crusty bread would be my choice, but I think tortilla chips would also work well. I offered crostini, wheat scoops, and garlic/Parmesan pita chips. All worked well! can this be prepared and baked the next day. Could this be turned into a meal by adding pasta? Sounds too good to have just as an appetizer. I think you are onto something Jessica! I’m thinking it would be good and I might have to try it myself soon! For the Super Bowl, my son wants to have all different appetizers instead of a meal. 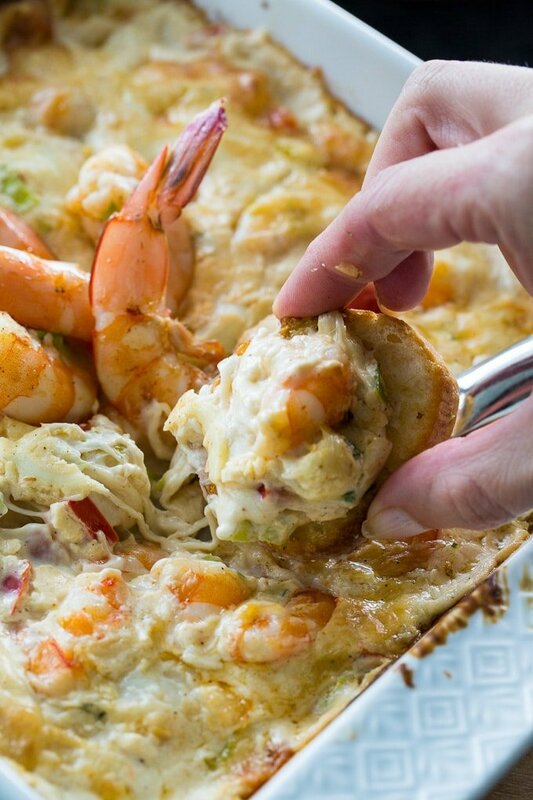 He LOVES seafood and cheese, so this luscious sounding recipe is on the menu. Thanks so much. My family is not a fan of Mayo, what can we use in the place of mayo? You can try substituting Greek yogurt. Can you make ahead and then throw into oven when you get to destination? Does the recipe call for one and a half pounds of shrimp? It calls for one and a quarter pounds of shrimp but 1 pound is enough. Going a little over a pound will ensure that there is shrimp in pretty much every bite. This is fantastic! Everyone loved it and I had several requests for the recipe. So good to hear Cindy!